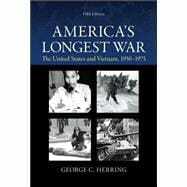 Respected for its thorough research, comprehensive coverage, and clear, readable style, America’s Longest War explores the origins of the thirty-year war for Vietnam. It seeks to explain how the United States became involved and the consequences of its actions for the Vietnamese as well as Americans. It assesses the multiple legacies of the war and offers guidance for students on what Americans should learn from this national experience that continues to resonate today.